84 F. high on Wednesday in the Twin Cities (considerably warmer than predicted). 76 F. average high for September 5. 72 F. high on September 5, 2011. .02" rain fell on the metro early Wednesday. .69" rain soaked Rochester yesterday (strong to severe storms rumbled across far southern Minnesota). .21" rain predicted for MSP late tonight ahead of a second, stronger cool front. Highs hold in the 60s behind the front Friday; the coolest day in sight. September Breeze. ECMWF (European) model data suggests a cool Friday, highs stuck in the 60s with a brisk north wind. We warm up to near 70 Saturday, low to mid 70s Sunday with less wind, highs reaching into the 80s Tuesday before cooling off again by the middle of next week. 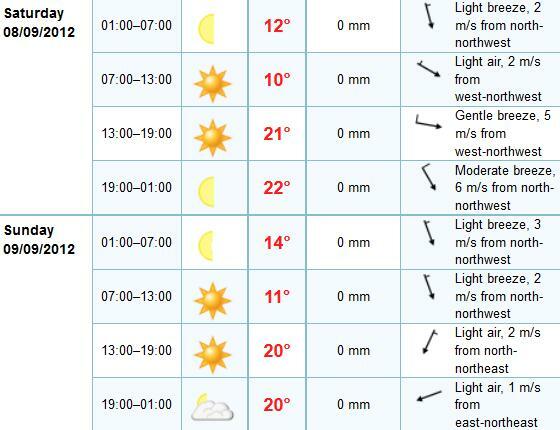 No significant rain is in sight. As lovely as this weather is, 2-4" rain over 2-3 days would qualify as lovely right now. 39.14" of rain fell on Pensacola, Florida during meteorological summer (June 1 to August 31). That makes this the wettest summer on record, 14.94" wetter than average. The previous record: 37.04", in 1994. Source: HootSuite. DNC: Did They Jump The Gun By Moving The President Indoors? Full disclosure: I wouldn't want to be the poor schmuck providing hourly weather updates and forecasts for the Democratic National Convention in Charlotte. Based on a forecast of strong/severe storms President Obama's address was moved indoors, to a much smaller venue this evening. 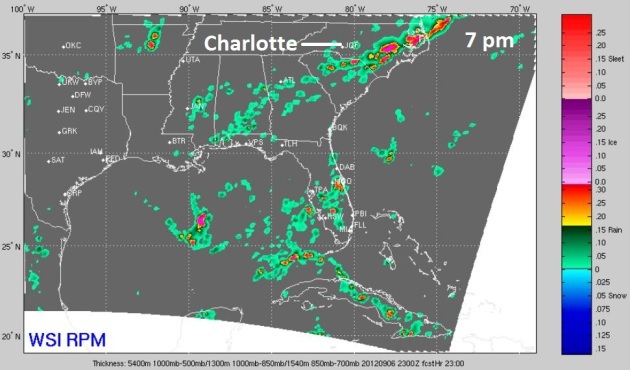 But if the ultra-high-resolution WSI RPM model is correct, most of the storms will be east of Charlotte by 7 pm edt. Yes, it's close for comfort, but it would be ironic, after scrambling and moving to Plan A, if the skies over Charlotte were tranquil this evening. We'll see. “Oh, my bones are aching. It must be about to rain.” – Everybody’s grandpa, ever. An interesting post, on why old injuries, aches and pains often flare up ahead of a storm or frontal passage from mentalfloss.com, below. It's Baaack. Isaac's soggy dregs pushed up the Mississippi, then veered across the Ohio Valley toward Pennsylvania. But a tiny chunk of energy, moisture and "spin" did a giant loop, pushing south across Kentucky and Tennessee into Alabama (squeezing out some 10-15" rains), now winding up where it started early last week - off the Louisiana coast, where it may strengthen back into a tropical storm. Something similar happened in the 90s, but I can't remember a hurricane weakening, then coming back from the dead like this for 15-20 years. 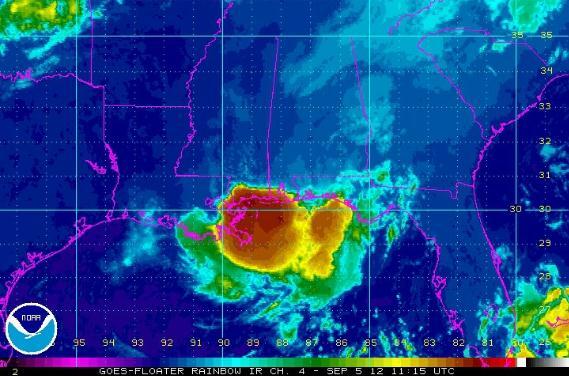 According to NHC there's a 50% chance it could become a tropical storm....probably not Isaac. Next up: Nadine? Image: NASA MODIS. Hurricane Naming Conventions: When Is It OK To Recycle A Name? Here's some additional guidance and perspective from The National Hurricane Center (NHC), via FB: "There have been quite a few inquiries about whether the name "Isaac" would be given to the area of disturbed weather currently located along the northern coast of the Gulf of Mexico, if it were to develop into a tropical cyclone. The short answer is no, it would get a new name. Our analysis of the satellite, surface, and lower-tropospheric radiosonde data suggested that the disturbance we're currently following originated within Isaac's broad circulation, but that it had its own surface pressure minimum distinct from Isaac's. This was perhaps most apparent late in the day on Monday, when the residual surface center of Isaac was located over western Kentucky while a second weak low was located over northern Mississippi and Alabama. Isaac's circulation continued to weaken after that and became difficult to track, while the new disturbance moved slowly toward the Gulf coast. So what basically happened here is that a little piece of Isaac broke away and moved south. OK, now everybody get your lawyer and grammar hats on. The National Weather Service rule that applies here reads: "if the remnant of a tropical cyclone redevelops into a tropical cyclone, it is assigned its original number or name". Notice the rule says "the" remnant, and not "a" remnant. This means that the storm's primary remnant (and not just any old part of it) has to re-develop in order for the name to be retained. Since the primary remnant of Isaac was still in Kentucky when the new low formed and broke away, the rule dictates that the new low is not entitled to the name Isaac. This rule actually makes a lot of sense. If a storm died and each of two parts re-developed, we couldn't give the same name to both parts. Only the primary remnant would retain the name, while a lesser remnant or part would get a new name." "Bermuda Shorts". David Lahuta is a Bermuda-based travel writer and TV correspondent, and he updates his blog on a regular basis. He's bracing for the arrival of Hurricane Leslie. We'll be checking back to see how he (and the island) weather what could evolve into a category 2 hurricane. Here's an excerpt of his latest post: "On its current track the storm is expected to approach Bermuda this weekend, with winds as much as 110 mph forecast to whip the western portion of the island (a.k.a. The End Where I Live). However, my catastrophe modeler insurance pals are calling for a direct hit from a Category 2 hurricane sometime on Sunday. And trust me, these people know what they're talking about. Their business is risk. 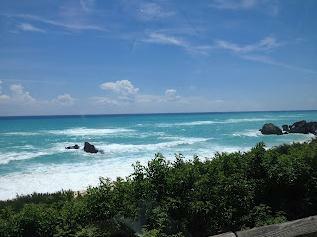 If the surf that's been rolling over the island's south shore is any indication, Bermuda should start bracing for something major (the above picture taken yesterday from Warwick Long Bay doesn't even do it justice; the surf is indeed up)." GFS Solution: 5 pm Saturday. You can understand why David and every other resident of Bermuda is concerned. 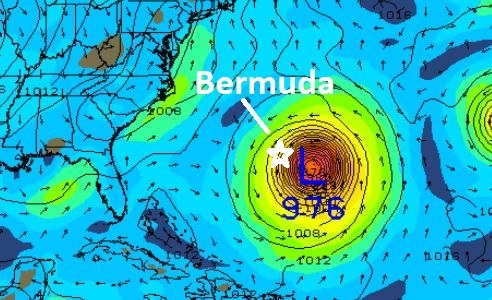 Models are hinting at a Category 2-3 hurricane coming very close to Bermuda over the weekend. With a little luck the center of Hurricane Leslie will pass just east of this island nation. Another Cool Front...and "Leslie". The NAM model shows another band of showers pushing across Minnesota tonight, followed by a Friday clearing trend. 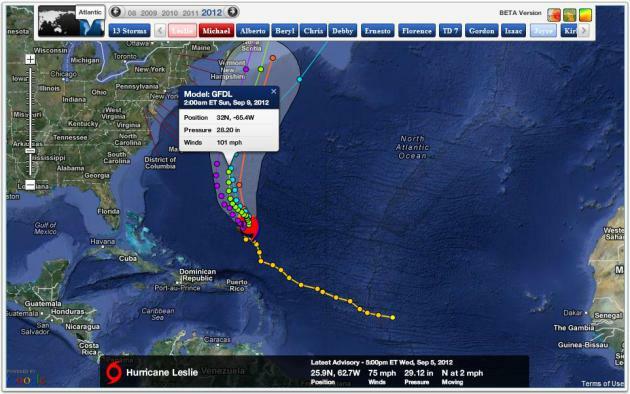 Note Hurricane Leslie coming into view on screen right, risk to Bermuda, but probably not the east coast of the USA. Is it me or does Leslie appear to be tracking more northwest than north? 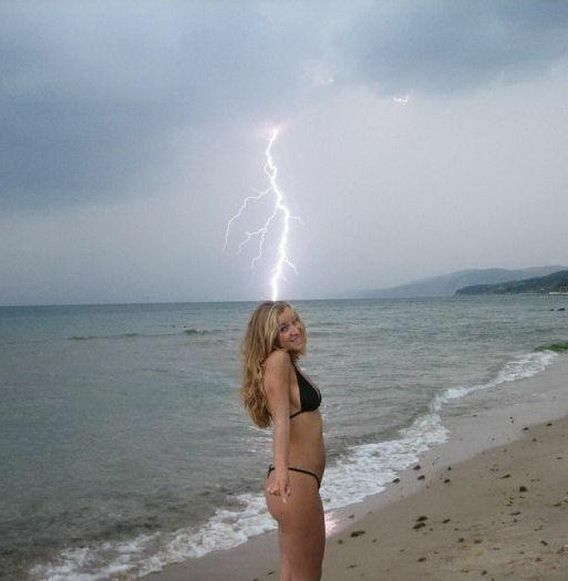 I hope it's an optical illusion. Predicted Track of Hurricane Leslie. New England will be spared (although surfers will be very happy on Cape Cod by the weekend). Bermuda may take a direct hit from a Category 2 hurricane (GFDL model above shows sustained winds of 101 mph by Sunday); and with North Atlantic water temperatures as much as 10 F. warmer than average, I wouldn't be surprised to see Leslie maintain hurricane status as it comes ashore over Newfoundland, Canada early next week. Map: Ham Weather. 7 Hurricanes. Just because a hurricane doesn't hit the USA (or some other country) doesn't mean that it doesn't "count". 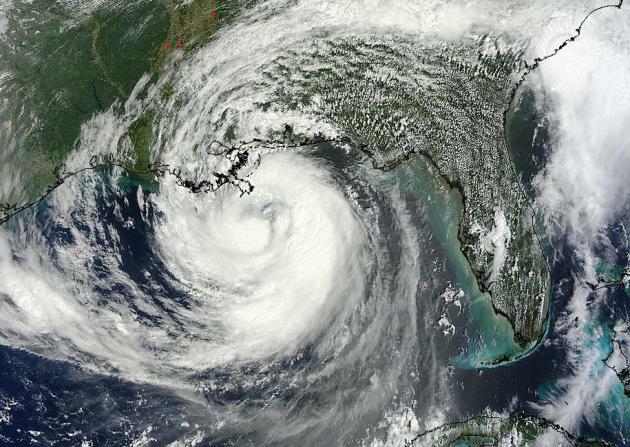 Michael was upgraded to a hurricane overnight, the 7th Atlantic hurricane of 2012 so far. Graphic: Ham Weather. Aurora Watch. I seem to have better luck seeing the Northern Lights in Autumn than any other season. Skies are clear, fewer storms and fronts, and with lower dew point and drier air and less haze/humidity it makes it easier to see one of the most impressive spectacles you'll ever witness. With numerous solar flares in recent days the odds of seeing The Northern Lights, the Aurora Borealis, just went up. There's no way to predict this magical phenomenon in advance, but it might be worth a look in the coming nights. 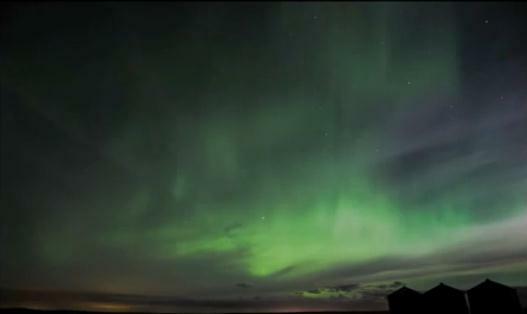 Here's a great YouTube video clip from Calgary, courtesy of Canadart.net: "Clouds, Shooting stars and northern lights. We went for a tiny drive north of Calgary (Alberta, Canada) after being informed there was a show coming our way. It really worth the drive." RPM Model. This is one of the better weather models out there, created and maintained by WSI, Weather Services International, owned by The Weather Channel. Tom Skilling has the best weather team in Chicago at WGN-TV. 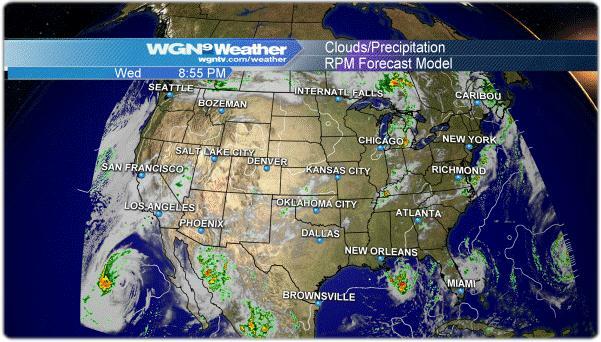 You can check out the latest (national) model run at chicagoweathercenter.com. Good stuff. 7 TRILLION Gallons Of Water From Hurricane Isaac? Bob Ryan is a TV meteorologist at WJLA-TV in Washington D.C., one of the legends in the industry, a real pro. 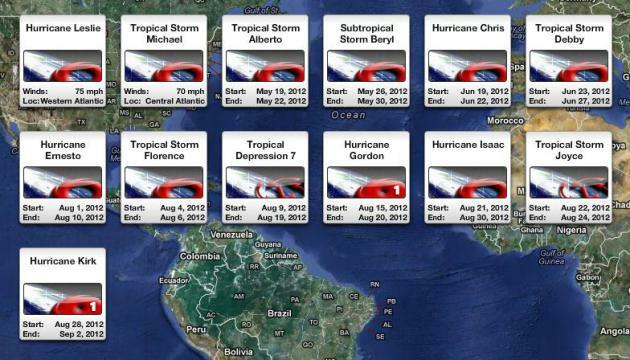 He had a blog post that caught my eye in the wake of Isaac, some truly eye-opening numbers that make my brain hurt. 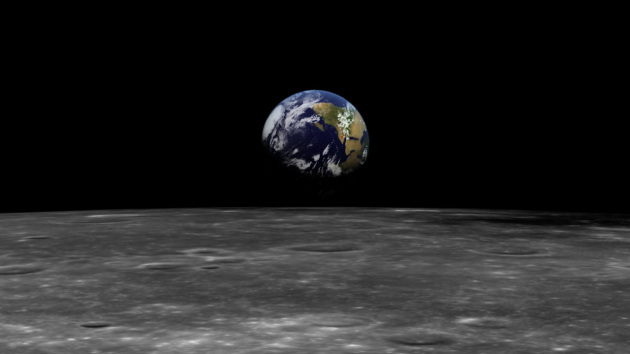 Here's an excerpt: "You would have to stand there every minute, every day for about 3 MONTHS to see 7 trillion gallons. 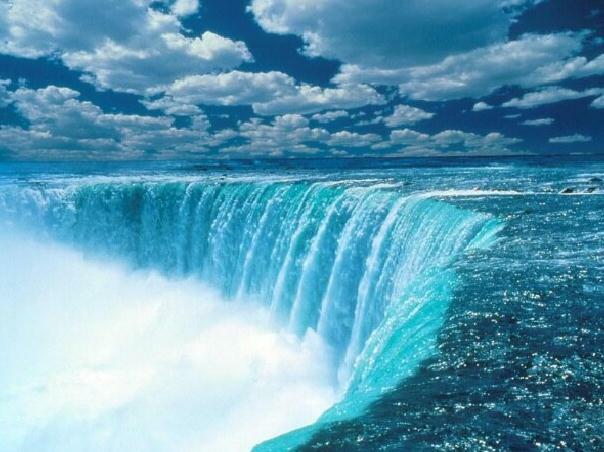 Or 7 trillion gallons is also enough fresh water to give every man, woman and child on earth, 1 gallon of fresh water every day for about 3 years. Monster storm such as Isaac are tremendous engines that create enormous power and destruction and indeed incredible amounts of water. 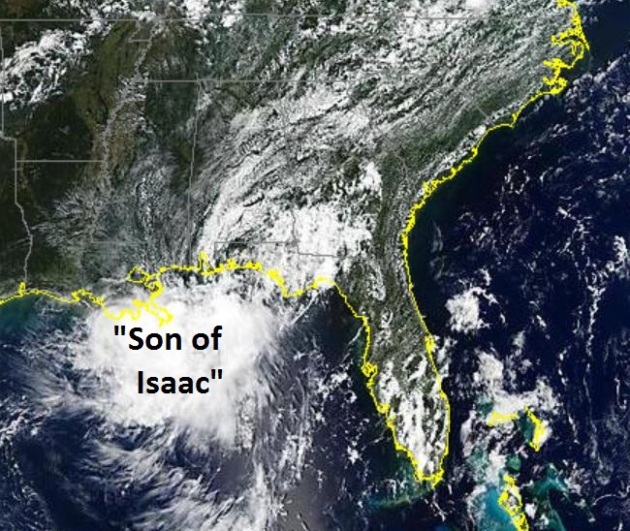 And Isaac is not doe yet. The winds are decreasing but the path is very likely to bring some rain our way before the Labor Day holiday weekend is over...."
Hurricane Isaac Sweeps Tons Of Dead Rats Onto Mississippi Beaches. The appetizing details from The Star Online and Reuters: "Tens of thousands of rats killed by Hurricane Isaac have washed up onto the beaches of Mississippi and created a foul-smelling mess that officials say will take days to clean up. When the hurricane lifted the tides, the water washed across the marshy areas in Louisiana where the semi-aquatic rats live and forced them to ride the waves into Mississippi until they succumbed to exhaustion and drowned, said David Yarborough, a supervisor for Hancock County on the Gulf Coast." 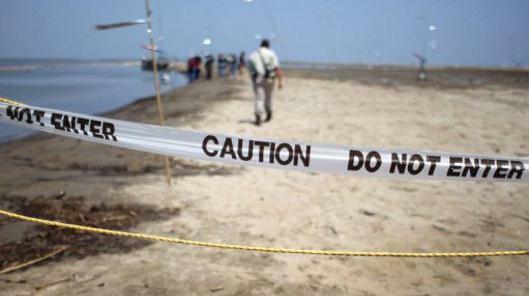 Hurricane Isaac Deposits Oil, Possibly From Deepwater Horizon, On Louisiana Beaches. The story from Mother Nature Network; here's a clip: "The beaches of Elmer's Island in Louisiana are "littered with tar balls of every size," according to Robert Barham, secretary of the Louisiana Department of Wildlife and Fisheries. The oil and tar balls, probably originating from the BP Deepwater Horizon oil spill of 2010, were stirred up by Hurricane Isaac last week and extend as far as a mile out to sea, forcing the state to close 12 miles of Gulf coastline to fishing and other activities, the New Orleans Times-Picayune reported. Barham told the press that the tar balls will be analyzed to see if they originated from the Deepwater Horizon spill. A spokesperson for the U.S. Department of the Interior told Our Amazing Planet last week that an estimated 1 million gallons of oil from the Deepwater Horizon spill are hiding in the underwater sediment off the coast of Louisiana, as well as in marshes and on nearby beaches. The hurricane was expected to stir up sediment and release oil, pesticides, fertilizers and other toxic chemicals..."
NOAA's "Weather Central" Settles Into Its New Home. 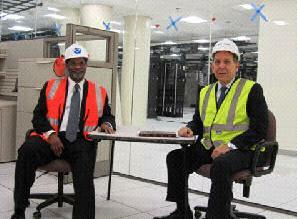 800+ scientists and employees of the National Weather Service in Washington D.C. are moving to new digs. Here's an excerpt of a post at "The Front Page", from the American Meteorological Society: "Riverdale, Maryland’s 800 newest citizens are starting to move in: the suburb of Washington, D.C., which is just a hailstone’s throw from the University of Maryland, is suddenly inheriting a major influx of meteorologists and their colleagues. This newcomers are a cadre of NOAA scientists with a long history behind them, and with the opening of the new 268,762 square-foot, four-story National Center for Weather and Climate Prediction, a new era begins for the National Centers for Environmental Prediction as well as colleagues from the National Environmental Satellite, Data, and Information Service and the Air Resources Laboratory." Photo credit: "David Caldwell and Louis Uccellini, back in April, awaiting a first meeting at the then-unfinished new home for NCEP and other NOAA groups, in Riverdale, Maryland." Why Does Bad Weather Aggravate Old Injuries? Here's a fascinating post from mentalfloss.com. Now I have a good answer to a question that comes up all the time. "Why does an approaching storm or front make me ache?" Here's an excerpt: "The idea that certain aches and pains correspond with, and can even predict, the weather is widespread, and has been around since at least the days of ancient Greece. The typical explanation for bad-weather-related aches is that the drop in barometric pressure that comes with a storm causes soft tissue and fluid around joints to expand, irritating nerves and causing pain, especially at the sensitized site of an arthritic joint or an old injury. The scientific evidence for the phenomena, which has been studied since the early 20th century, is mixed. Some studies have found that changes in barometric pressure increased pain, others found that it decreased it, and still others found no correlation. The influence of temperature and relative humidity has also been studied, and is also unclear. (For more on some of this research, see here and here)." Super-Anvil. 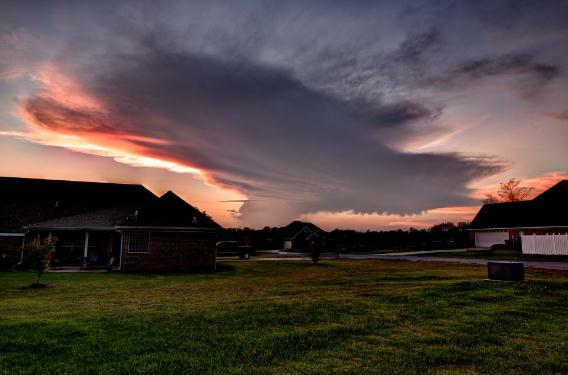 Allen Gresham captured this sprawling thunderhead anvil near Starkville, Mississippi Wednesday. Talk about upper level divergence! Geek-speak for ripe conditions aloft for hurricane formation. Shelf Cloud. 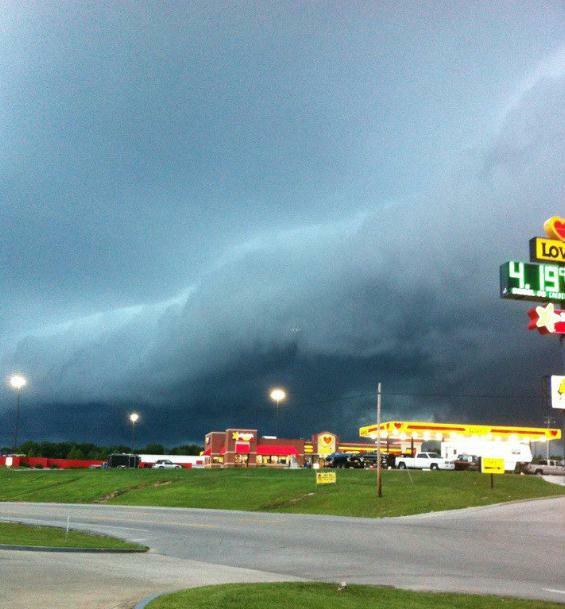 Jeanne Martin snapped this photo out ahead of yesterday's squall line that swept across the Ohio Valley. 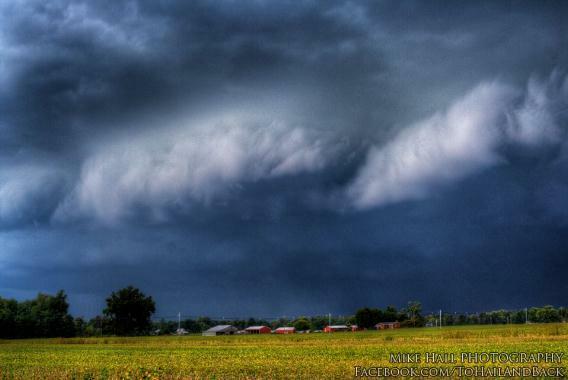 Photo from North Corbin, KY via Facebook and WeatherNation TV. If Content Is King, Multiscreen Is The Queen, Says New Google Study. So how many screens do you use during a typical day? Migrating from desktop to tablet or smartphone for much of your work and entertainment? Here's an excerpt of an article at Tech Crunch: "New research out from Google, working with market analysts Ipsos and Sterling Brands, puts some hard numbers behind the often-noticed trend of how people in the U.S. are using a combination of phones, tablets, computer and TVs to consume digital content. While each of these has a significant place in our consumption today, their real power lies in how they are used together — in combination, 90% of all of our media consumption, or 4.4 hours per day, is happening across all four (which doesn’t leave much room for paper-based books and publications; or for radio). This not only has implications for how content is designed, but also for how companies like Google will continue to hedge their bets across all four screens." It's Becoming Clear That No One Actually Read Facebook's Prospectus Or Mark Zuckerberg's Letter To Shareholders. Here's a clip from an interesting article at Business Insider: "As Facebook's stock continues to collapse, the volume of whining is increasing. Four months ago, you will recall, Facebook was viewed as "the next Google." Now, with no major change in the fundamentals, it's viewed as an over-hyped disaster. Meanwhile, there is ever-louder grumbling that 26-year-old Facebook CEO Mark Zuckerberg is in over his head and should be relieved of command. As I listen to all this whining, I have a simple question: Didn't anyone even read Facebook's IPO prospectus? The answer, I can only assume, is "no." 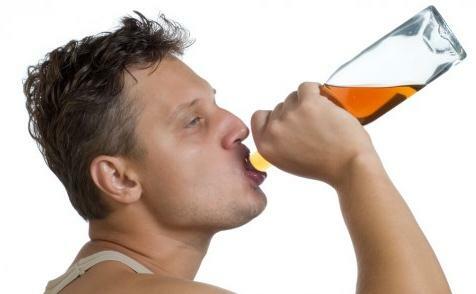 Face-Scanning Cameras Could Pick Out Drunks. As if you're not already paranoid enough about all those cameras out there tracking you, here's one more reason to be concerned. Maybe I won't have that second drink. Details from gizmag.com: "People who are inebriated in public places (such as airliners or malls) can definitely create problems. Sometimes, though, it’s difficult to tell if someone really is under the influence. Instead of making every “jolly”-looking person take a breathalyzer test, Greek researchers are suggesting something less intrusive – video software that can spot drunks by analyzing their faces. The software, which is currently being developed at the University of Patras, works in two ways." Strengthen Your Self Control. 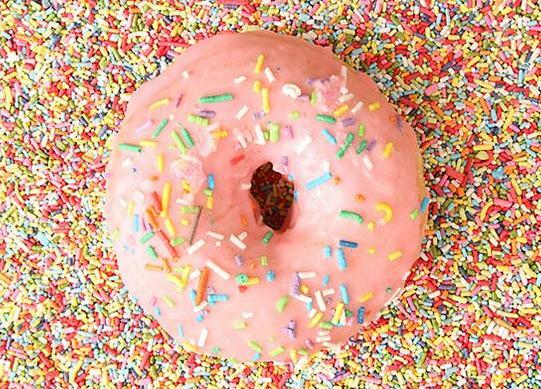 How To Improve Your Willpower And Overcome Urges. I somehow worked up the will to read this article from livestrong.com; here's an excerpt: "...But there’s another trick you can use if you feel your willpower slipping: Flex your muscles. Iris W. Hung of the National University of Singapore and Aparna A. Labroo of the University of Chicago conducted a study in which participants were who were instructed to tighten their muscles, regardless of which muscles they tightened, demonstrated a greater ability to withstand pain, consume unpleasant medicine, attend to disturbing but essential information and overcome tempting foods. The researches theorize that the body primes the mind. Mental imagery, used by athletes worldwide, is another willpower hack. According to Harvard researchers, people who do a good deed or who imagine doing a good deed are better able to perform tasks of physical endurance. In a strange twist, those who envisioned themselves doing something bad had more endurance than those who envisioned themselves doing something good. In this case, researchers believe that the mind primes the body." Weekend Weather Preview. Yes, we will all learn the metric system, kicking and screaming into the 21st century. The web site I use (ECMWF model data) only displays in metric. English units aren't even an option, so there you go. 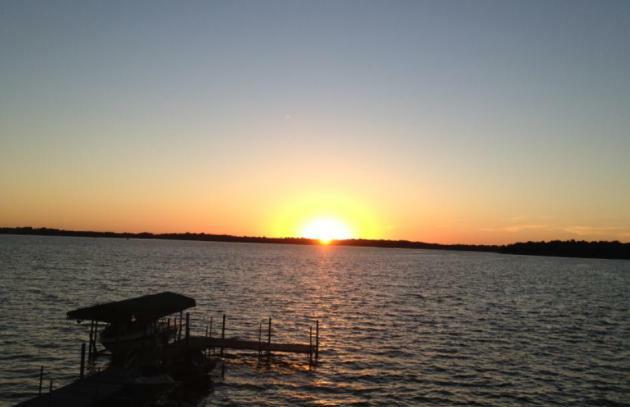 Good news: a fine weekend is shaping up with low humidity; Sunday the warmer day for the lake with less wind. A More Comfortable Front. You could feel it in the air, a big drop in humidity. Dew points were in the 60s Tuesday, but a brisk west wind behind cool front #1 dropped dew points into the 40s by late afternoon yesterday. There was enough residual warm air in the lowest few thousand feet of the atmosphere for temperatures 5-10 F. warmer than average, ranging from 72 at Grand Marais to 80 St. Cloud, 84 in the Twin Cities. For the record (not that anyone cares all that much) I like snow, I enjoy autumn, I tolerate February, but I LOVE September. In fact I suspect that, as warm weather months go, this may well be the best month of the year. Your Honor, let me make my case! June is peak severe month; buckets or rain and sirens every other day. July is the hottest month of the year. No kidding. August in fine, but humidity levels are high and bugs still show up on Doppler. By September dew points drop, highs are in the 60s & 70s, lake water still warm enough for one more dip; mellowing leaves: odds of a dry weekend higher than summer. September is prime time for hurricanes and fog. Mercifully we only have to deal with the latter, the result of lingering moisture and longer nights allowing the air to cool to the dew point, creating lazy clouds: fog. A cool, sunny start gives way to increasing clouds; showers possible tonight ahead of a reinforcing surge of Canadian air. Get ready for a string of days in the 60s and low 70s into Sunday; the nicer, sunnier day of the weekend. A Saturday clipper may spark showers over Wisconsin; probably dry for Minnesota. * photo above courtesy of Steve Burns. 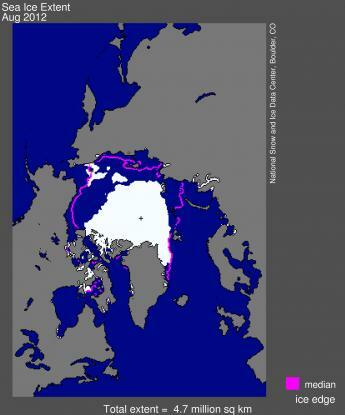 Arctic Sea Ice Falls Below 4 Million Square Kilometers. Here's an excerpt from The National Snow and Ice Data Center: "Following the new record low recorded on August 26, Arctic sea ice extent continued to drop and is now below 4.00 million square kilometers (1.54 million square miles). Compared to September conditions in the 1980s and 1990s, this represents a 45% reduction in the area of the Arctic covered by sea ice. At least one more week likely remains in the melt season." Graphic credit above: "Arctic sea ice extent for August 2012 was 4.72 million square kilometers (1.82 million square miles). The magenta line shows the 1979 to 2000 median extent for that month. The black cross indicates the geographic North Pole." Sea Ice Index data. About the data. Credit: National Snow and Ice Data Center. Uncharted Waters. 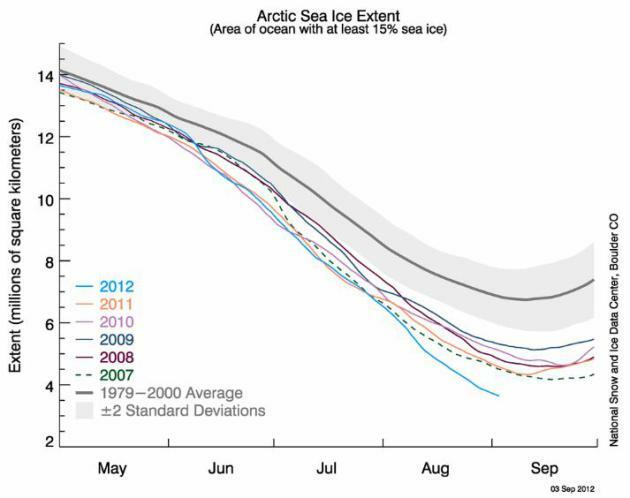 More detail from NSIDC: "The graph above shows Arctic sea ice extent as of September 3, 2012, along with daily ice extent data for the previous five years. 2012 is shown in blue, 2011 in orange, 2010 in pink, 2009 in navy, 2008 in purple, and 2007 in green. The 1979 to 2000 average is in dark gray. The gray area around this average line shows the two standard deviation range of the data." Sea Ice Index data. Credit: National Snow and Ice Data Center. 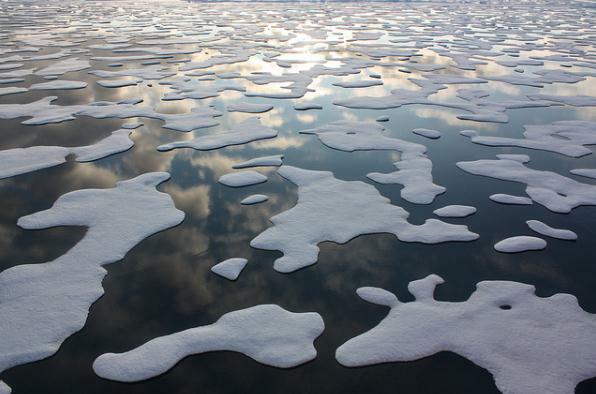 On Thin Ice: Time-Frame To Save The Arctic Is Melting Away. More disturbing news in this post at climatecodered.org; here's an excerpt: "Something extraordinary is happening when graphs of melting Arctic sea-ice have their vertical axis redrawn because the data are falling off the chart. But that’s what has occurred in the last 10 days, since the extent of floating Arctic sea-ice broke the satellite-era minimum record on 24 August. On that date it was 4.2 million square kilometres, according to data from the Japan Aerospace Exploration Agency. Since then, an additional half a million square kilometres of sea-ice has melted. The extent on 4 September was just half of the average minimum extent of the 1980s. 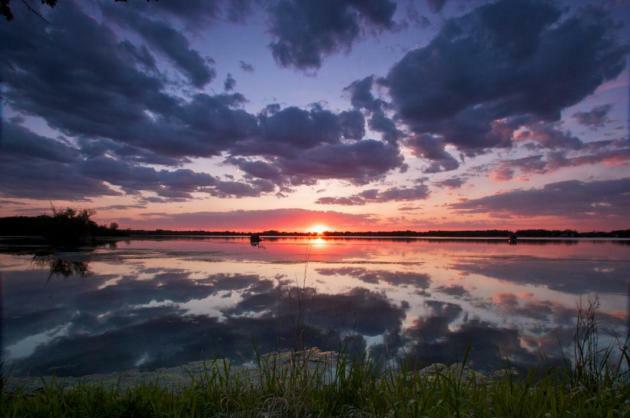 At the current rate of loss, with one to three weeks left in the northern melt season, the minimum may well shrink below 3.5 million square kilometres. 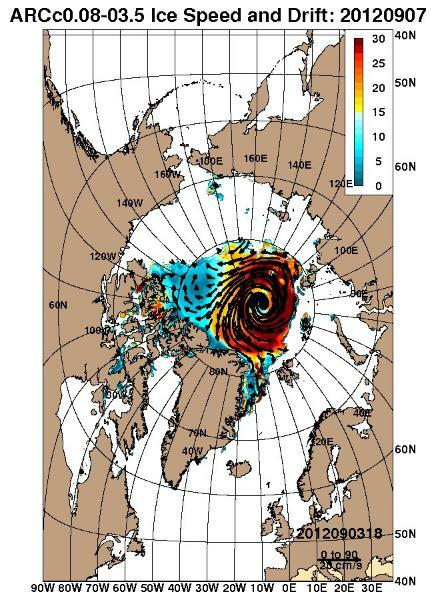 This is an astounding story...."
Death Spiral Watch: Experts Warn "Near Ice-Free Arctic In Summer" in A Decade If Volume Trends Continue. Details from Think Progress: "The sharp drop in Arctic sea ice area has been matched by a harder-to-see — but equally sharp — drop in sea ice thickness. 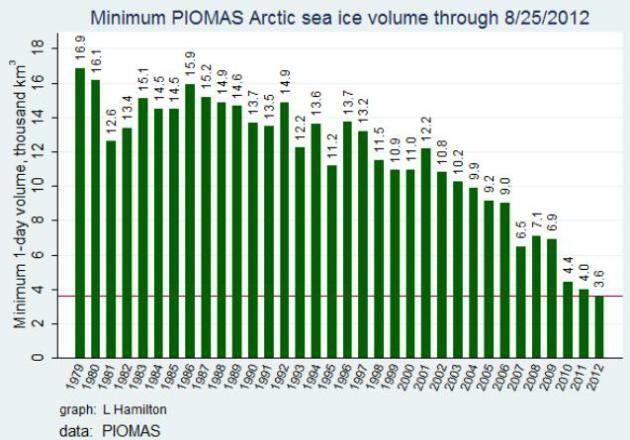 The combined result has been a collapse in total sea ice volume. Many experts now say that if recent volume trends continue we will see virtually ice-free conditions sometime in the next ten years. And that may well usher in a permanent change toward extreme, prolonged weather events “Such As Drought, Flooding, Cold Spells And Heat Waves.” It will also accelerate global warming in the region, which in turn will likely accelerate both the disintegration of the Greenland ice sheet and the release of the vast amounts of carbon currently locked in the permafrost." Ruined Summer: How Climate Change Scorched The Nation In 2012. Here's a brief overview of a report from The National Wildlife Federation, with a link to the full report: "It is certainly altering them in dramatic ways and rarely for the better. 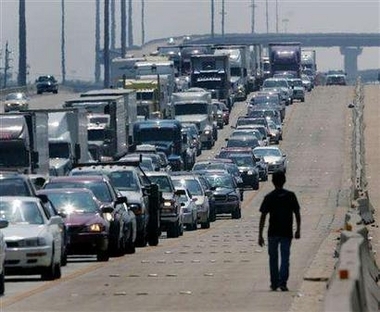 The summer of 2012 has been full of extreme weather events connected to climate change. Heat records have been broken across the country, drought conditions forced the United States Department of Agriculture (USDA) to make the largest disaster declaration in U.S. history, and wildfires have raged throughout the West. New research by world-renowned climate scientist James Hansen confirmed that the increasingly common extreme weather events across the country, like record heat waves and drought, are linked to climate change. 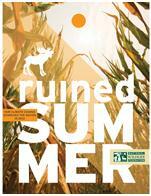 This report examines those climate change impacts whose harm is acutely felt in the summer. Heat waves; warming rivers, lakes, and streams; floods; drought; wildfires; and insect and pest infestations are problems we are dealing with this summer and what we are likely to face in future summers." Mitt Romney: Climate Change Is Real, But Addressing It Would Be Wrong. The story from Boing Boing; here's an excerpt: "...Perhaps most surprising was his response to a question about climate change. Instead of attempting to flatly deny the evidence, Mitt Romney has apparently moved on to acknowledging that climate change is happening—while simultaneously overplaying the uncertainty surrounding specific risks, and claiming that even if climate change is a big problem there's nothing we can really do about it anyway ... because China. Personally, I think that's pretty interesting. Climate scientists, and the journalists who write about them, have been talking, anecdotally, about seeing this exact rhetorical shift happening in conservative circles. It seems that the Republican presidential nominee is now one of the people who acknowledge climate change exists, but would still rather not take any decisive steps to deal with it." Is Romney Warming Up To Global Warming? 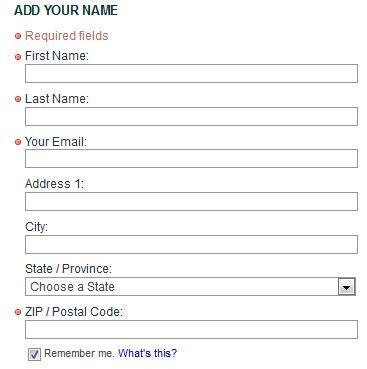 Here's an excerpt of an Op-Ed at The Washington Post: "...So Romney’s response to a questionnaire — prepared by Scientific American and ScienceDebate.org — is one interesting sign of the emergence of the post-primary candidate. Romney endorses the view “that the world is getting warmer, that human activity contributes to that warming, and that policymakers should therefore consider the risk of negative consequences.” He accepts, in short, the consensus view of the National Academy of Sciences, while raising some questions about the pace of climate change and the extent of human contribution. Romney goes on to say that cap-and-trade legislation is not the answer, since it only applies to the United States and not to the developing world, where the growth in carbon emissions is greatest. The alternative, in his view, is a “no regrets” policy, in which this nation lowers emissions through new technology instead of regulations that impose a competitive disadvantage on the economy." In your role as moderator of the first presidential debate, you have the opportunity to ask questions about the most pressing issues facing our country. We urge you to ask President Obama and Governor Romney how they will confront the greatest challenge of our generation -- climate change. This summer, the climate crisis has fallen right into America's front yards--in some cases literally. With trees crashing through their windows, fires burning through their neighborhoods, water flooding under their doorsteps, and droughts destroying their crops, Americans have been hurting from the effects of weather extremes that climate scientists have predicted would happen as a result of global warming." Obama and Romney On Climate Change Science. Here's a good recap on each candidate's position on climate science from meteorologist Jason Samenow at The Washington Post's Capital Weather Gang. An excerpt from an important article: "With the race to the White House heating up, it raises the question: where do the presidential candidates stand on global warming? In short, Obama is a global warming “believer” but has provided little substance to back his conviction and seldom talks about it. Romney, on the other hand, presents a wavering, sometimes mocking assessment on the severity of the issue." As recently as June 2011, Romney was telling voters in New Hampshire that “the world’s getting warmer,” that “I believe that humans contribute,” and that “I think it’s important for us to reduce our emissions of pollutants and greenhouse gases.”Since then, however, Romney has softened his stance. “I don’t know if [rising temperatures are] mostly caused by humans,” he told another New Hampshire crowd last summer.